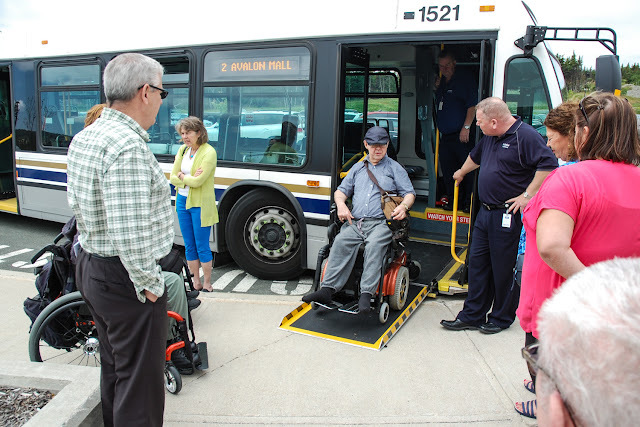 Metrobus is pleased to offer its customers wheelchair accessible service through the use of new, accessible low floor (ALF) buses. 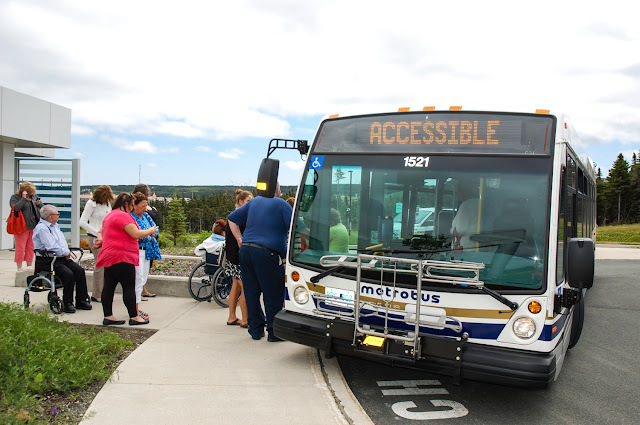 Metrobus is introducing the wheelchair accessible service on a "phased in" basis, starting with Routes 1, 2 and 3 to increase access for customers using mobility devices. Features the international accessibility symbol on all four sides of the bus. Having an accessible bus service will be of tremendous benefit to our disabled community and will take some of the pressure off of GoBus, the city's only para-transit system. I was invited to attend an orientation session on the new wheelchair accessible bus service at the Metrobus Transit Centre. This was a great opportunity to see the accessible buses firsthand and to gather information about the service. Having a system that is accessible for all disabilities and conditions is a challenge, but we are moving in the right direction. 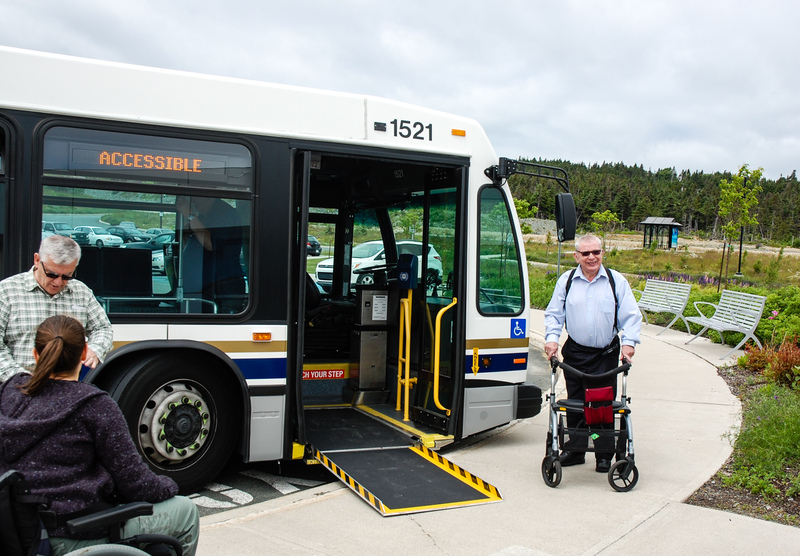 Just a couple of months ago, the City of St. John's unveiled two new accessible taxi vans - one with Newfound Cabs, and one with Jiffy Cabs. "These taxis are a perfect example of inclusion in action, because they can be accessed by all individuals, including people with mobility disabilities." said Clyde Jackman, minister responsible for the Status of Persons with Disabilities. "The new accessible taxi service will make a significant difference in people's lives. Transportation is a key to inclusion and now, with accessible taxis on the road, there are fewer barriers and more equitable access to opportunities." Transportation is about a lot more than just getting around. It is about connecting people with all of the things that make life worth living: family, friends, education, health care, job opportunities, and recreation. 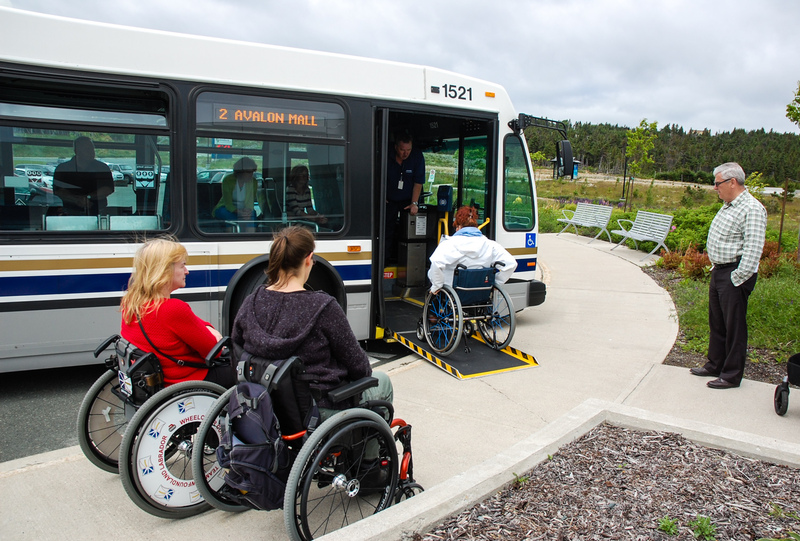 Having accessible taxis as well as low floor buses means that people with disabilities and mobility issues now have greater choice in how they move around our city. 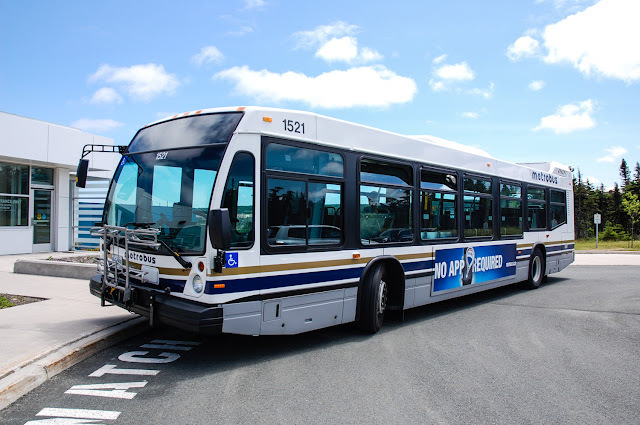 Providing equal access to affordable and reliable transportation widens opportunities and provides all individuals living in our communities with an equal opportunity to succeed. So far, I managed to go though only some of posts you discuss here, but I find them very interesting and informative. Just want say thank you for the information you have shared. Regards.